Ozore Station on the Iida Line. It is difficult to access by car due to precipitous terrain, hence news and post mails are delivered by train. New station building made by bricks are completed in 1997. Photo in Oct, 1992. Nagoya Station on the Tokaido Mainline and the Kansai Mainline. 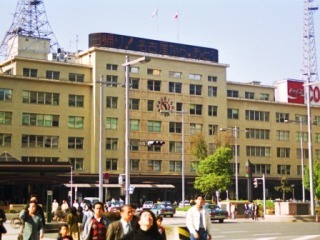 This station building was completed in 1937 as the largest one in the Orient and used by JNR Nagoya District Authority. Demolished in 1993 and rebuild with the largest station building in the world. Photo in Jan, 1994. Nara Station on the Kansai Mainline and the Sakurai Line. This station building was constructed in 1934 with fusion of Western and Eastern style. The building was replaced in 2003, but was not demolished but moved nearby and exists as tourist information. Photo in Apr, 1992. Takamatsu station on the Yosan Mainline and the Koutoku Mainline. This station is a terminus functioned as a gateway of Shikoku District, and had a pier of train ferry. This station building was scrapped in 1999 to replace. Photo in Nov, 1990. Taisha Station on the Taisha Line. Taisha Station was the terminus of Taisha Line for tourists of famous Izumo Taisha Shrine. Regrettably abolished in 1990. Station building is significant pure Japanese style, and preserved with platform. Photo in Mar, 1992. Izumo-Yokota Station on the Kisuki Line. This station building is the original one since opening in 1934. Traditional architecture suitable for Japanese mythological village. Photo in Mar, 1992. Mojiko Station on the Kagoshima Mainline. This is the oldest station in Kyushu District, and was a gateway of this area until Kan-Mon undersea tunnel was opened in 1942. This Neo-Renessance style building was constructed in 1914, and designated as an Important Cultural Property by Japanese Government. Photo in Mar, 1989.